In the first folio published in 1623 Shakespeare's plays are grouped into three catagories, histories, comedies and tragedies. When the plays were performed at The Globe in London different coloured flags were used to advertise if the evening's performance was going to be a history (red), a comedy (white) or a tragedy (black). Some of these catagorisations are difficult for the modern reader or theatregoer to understand. For example The Merchant of Venice is classed as a comedy and Cymbeline is a tragedy. In the 21st century it might be thought that this should be the other way around. Cymbeline has elements of tragedy but to my mind it seems more of a romantic comedy. All is resolved in the end with the intervention of Jupiter in the penultimate scene of the play (Act V, Scene IV). 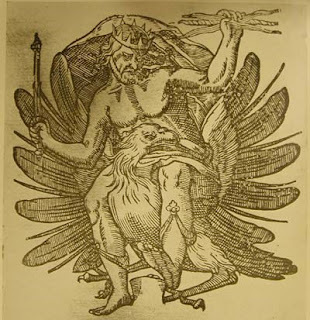 When this play was first premiered in April 1611 the audience must have been stunned when Jupiter descended on the back of an Eagle and started hurling thunderbolts around on the stage. Jupiter is a superb role for a senior actor to play who can deliver the lines on stage with authority and gravitas. Michael Horden played a superb Jupiter in 1983 in a BBC 2 production of Cymbeline. The appearance of Jupiter on stage with the circling four ghosts has been attributed by some authors as being Shakespeare's homage to Galileo with Jupiter on stage representing the planet Jupiter and the four ghosts the four Jovian moons. However, I am not convinced by this conjecture. It is thought that Cymbeline was written in Spring 1610 when the London theatres reopened after the plague. Within Shakespeare's chronology it is preceded by Pericles and followed by Winter's Tale. We are truly into a golden age here for Shakespeare when he wrote some of his finest plays. Galileo's Sidereus Nuncius was published on March 13 in 1610. Ben Johnson wrote in his eulogy that Shakespeare had "small Latin and less Greek". However, Galileo's Sidereus Nuncius is written in a simplified version of Latin called New Latin that is easy to understand. If Shakespeare could read Ovid's Metamorphoses in Latin he would have found few difficulties in reading Galileo's work if he was given access to a copy and he would have known about Jupiter's moons. Fortunately, the first folio has been digitised by the Bodelian Library is is freely available to study on line (http://firstfolio.bodleian.ox.ac.uk/). Let us look at Act V, Scene IV in more detail using the first folio text from 1623. Firstly the four ghosts appear. They are Posthumus'es mother, father and two brothers. Solemne Musicke. Enter (as in an Apparation) Sicillius Leo­ natus, Father to Posthumus, an old man, attyred like a war­ riour, leading in his hand an ancient Matron (his wife, & Mother to Posthumus) with Musicke before them. Then after other Musicke, followes the two young Leonati (Bro­ thers to Posth mus) w th wounds as they died in the warrs. They circle Posthumus round as he lies sleeping. Then Jupiter decends. He is angry about being chided by the four disrespectful ghosts and he asserts his authority by throwing a thunderbolt. Iupiter descends in Thunder and Lightning, sitting vppon an Eagle: hee throwes a Thunder bolt. The Ghostes fall on their knees. Shakespeare may well have read Sidereus Nuncius and it was published about the same time as he was writting Cymbeline. We know that Shakespeare spoke to sailors and seafarers as he writes of nautical matters in many of his plays. It is not inconceivable that a sailor or merchant could have brought a copy of Sidereus Nuncius to London shortly after it was published. However there is no evidence in the first folio that the four ghosts represent the four Jovian moons. There are four ghosts because they represent Posthumus'es deceased family, the ghosts are instructed to circle Posthumus not Jupiter and when Jupiter descends he scatters them. At no point in the first folio are the four ghosts instructed to circle around Jupiter. 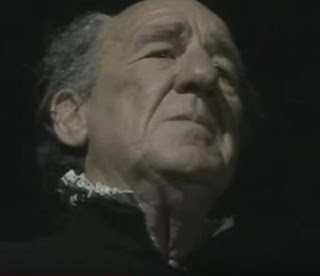 There are plenty of instances of Shakespeare being influenced by the new astronomy of the Tudor and Stewart eras but on balance I think that this scene, although widely referenced, is not one of them.